PHOTO: Allen Ramsey, DWCPhoto.com. Highlands junior Cooper Schwalbach (middle) powers his way through two Cooper defenders on his way to the end zone for a five-yard touchdown with 2:50 left in the second quarter. Schwalbach earned the team's Most Valuable Player award rushing for 150 yards on 29 carries and four touchdowns in the 42-22 Bluebird victory. UNION - The defense came out and quickly showed it is many miles ahead of last year. It just took some time for the offense to catch up. When that happened, the Highlands Bluebirds football team played up to its reputation of dominant football. Highlands pulled away in the third quarter for a 42-22 victory over the host Cooper Jaguars. The Bluebirds wore down the Jaguars in the second half with their depth. Highlands mostly sees players play on one side of the ball while Cooper has a number of players go both directions. "I think we just started executing our game," said Brian Weinrich, Highlands Head Coach. "We were really shooting ourselves in the foot in the first half. We just talked about getting better. We knew what we had to do. We couldn't worry about that anymore. We focused on what we had to do in the second half and started playing pretty well in the second half." Both teams tried to establish the ground game early to open things up for the passing game. But Highlands did it more consistently throughout the game. 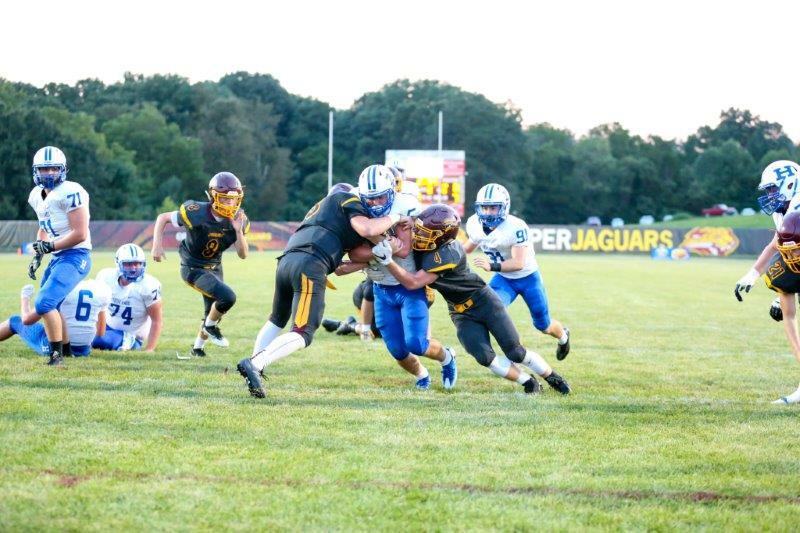 Junior Cooper Schwalbach powered his way to 150 yards on 29 carries and four touchdowns for an average of just more than five yards per carry. One score came while drawing a horse collar penalty. Those yards came after Schwalbach lost a fumble in the first half. He secured the ball better even though Cooper often needed several defenders to bring him down. "I was thankful the coaching staff let me continue to carry the ball after the fumble," Schwalbach said. "I couldn't have done it without the offensive line." Highlands finished with 251 yards of total offense compared to 244 for Cooper. Highlands allowed averages of about 304 yards rushing and 176 passing last year. The Jaguars put up 479 yards on 71 plays for an average of 6.7 yards per play in last year's meeting. But the Bluebirds took advantage of some Cooper turnovers late in the game to win 52-42. "I was really proud of the offense with the way we responded after not having a good first quarter at all," said Zach Deaton, Highlands Offensive Coordinator. "We really let our defense down. There were so many silly mistakes that we need to fix. But we consistently put some drives together and put those points on the board." The Jaguars recorded 227 yards rushing to 158 for the Bluebirds, but the majority of those yards came late in the game. Sophomore Anthony Witschey had 13 carries for 122 yards and two touchdowns in the final 4:31 of the game to lead Cooper. Highlands had 93 yards passing to just 17 for Cooper. Bluebird senior quarterback Carl Schoellman completed 8-of-21 passes for 93 yards, a touchdown and two interceptions as the offensive line gave him time. Senior wide receiver Jared Wogan led the Bluebirds with three catches for 56 yards and a touchdown. Cooper held Highlands senior Nick Veneman to just two catches for nine yards. "We have a lot of guys with experience doing what we need to do," said Sam Sparks, Highlands senior offensive lineman. "That's pretty much all it is. It just shows we're growing. We're all learning how to become men. We're learning from our mistakes and getting better from them." The Bluebirds put the Jaguars in a lot of passing situations and took advantage of the opportunities. Senior Joe Steiden picked off four Cooper passes and senior Harrison Traylor picked off another and returned it for a touchdown (see sidebar). "It just shows how much we've done in the off-season and how we knew we had to get better with only three interceptions (last year)," Traylor said. "We really focused on getting more turnovers in the off-season and I think it showed (Friday). We're back trying to fulfill the tradition we've had in the past." While the secondary picked off the passes, the Highlands defenders did a great job swarming to the ball. Cooper only had several runs of more than 10 yards until late in the game. "No matter what, we just play the next play," said Alex Starkey, Highlands junior linebacker. "We're always trying to get to the ball really fast. That's why we won (Friday). We could have had a lot less penalties, but overall we played well. This is a big confidence-booster." Highlands saw Nick Bowman and Crosley New record sacks. Logan Seiple and Nate Davis had tackles for a loss. The lone score in the first quarter came with 8:11 left when Highlands hiked the ball over the punter and out of the end zone for a Cooper safety. The Jaguars put one nice drive together in the first half and finished it when senior Justin Schlarman scored from five yards outwith 8:34 left in the half. "It was just trusting your keys, trusting what you see and doing what we've been doing all year," Weinrich said. "You get out there and get jittery. We have to get the film out (Saturday) and we have to get better." But Highlands eventually responded with two scores in the final three minutes of the first half. Schwalbach scored from seven yards with 2:50 left before Wogan separated himself from his defender by several steps and Schoellman found him down the right side for a 47-yard touchdown pass. Grady Cramer scored on the two-point run to put Highlands up 15-9 at halftime. The onslaught started when Traylor picked off an Armour pass and returned it 46 yards for a touchdown and Bowman made the point-after-touchdown kick to put Highlands up 22-9 with 10:08 left in the third quarter. Schwalbach broke free for a 20-yard scamper less than four minutes later to extend the Highlands advantage to 28-9. After a Steiden interception set Highlands up at the Cooper 26, Schwalbach scored again from seven yards out to give the Bluebirds a 35-9 lead. Schwalbach finished off the Highlands scoring in the fourth quarter. His 10-yard scamper made the score 42-9 Bluebirds - just three points from the running clock. The Bluebirds play one of their four home games Friday against Campbell County (1-0). Game time is 7 p.m.